So, it’s YES; the people of the Falkland Islands have voted, and they have voted to preserve their connection with Britain. In a 92% turnout 99.8% voted YES, that’s 1513 of the islands’ population of 2900 people. A search is now underway for the three losers who voted no, presumably planted members of Argentinian President Kristina Kirchner’s coterie. When the votes of the people who actually live in a place are dismissed as ‘irrelevant’ one simply knows what one is up against. Do the people of Argentina know what they are up against? I expect a great many do, those who are the victims of their president's mismanagement and incompetence. Her Falklands’ offensive is as much a distraction from her country’s internal woes as General Galtieri’s was in 1982. Her words are inflating faster, if such a thing is possible, than Argentina’s national currency. I should make it clear that, much as I despise Madame Botox, whose head is as empty as her lips are full, I admire Argentina as a nation. I was in Buenos Aires a few years ago over Christmas and New Year and I found the people unfailingly courteous, particularly those who taught me to tango! It may be a dangerous thing to confess but I have a sneaking affection for Eva Peron (I laid flowers by her family tomb in Recoleta Cemetery), as skilled a politician as Kirchner is incompetent. Argentina was also the home of Jorge Luis Borges, one of my all-time favourite writers, a man of unparalleled genius, who understood the English mind and English literature so well. It saddens me to see the country so ill-served by Kirchner, little more than a Chavez in skirts. If any one person is responsible for the Falkland’s record-breaking YES vote it is her. It was she in her arrogance and stupidity that pushed for this result. In her dismissal of a properly conducted democratic vote the world should be able to understand exactly what she represents - an old fashioned imperialist by any other name, full of contemp for the wishes of the ‘natives.’ My goodness, why on earth would the ‘natives’ want to be a colony of Argentina under Kirchner? Oh, yes, I know – to see the savings of a lifetime diminish to nothing and to see the economy ruined, all part of her magnificent legacy. They would be able to enjoy a lot of hot air, though. It might be good for floating balloons. I noticed from a post on Twitter last night that, in the wake of the referendum, Prime Minister David Cameron has called on Buenos Aries to take note. 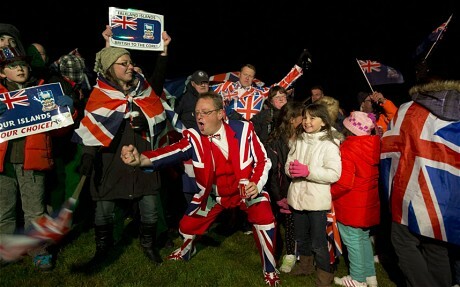 “The Falkland Islands may be thousands of miles away”, he said, but they are British through and through. People should know that we will always be there to defend them.” All I can say in response to this is that the Islanders best make ready to form their own self-defence force. Defend them, Prime Minister; oh, yes, with what exactly? When even the Archbishop of York was moved to criticise dangerous cuts in our defence capability then one knows just how bad things have become. Could we even defend ourselves, I ask, let alone the Falklands? I suppose we can always rely on the Seventh Armoured Brigade, the famed Desert Rats of the Second World War. There is only one problem – soon they will be a tank formation with no tanks. How I wish we could send Madame Botox and Gay Dave to one of the remoter and uninhabited islands in the Falkland’s group, there to fight it out as best they are able. I just thought as I was writing this of Jean Paul Sartre’s play No Exit, where three totally incompatible characters are sent to hell, isolated in the same room forever and ever and ever. To make up the trio I would add Barry O’Bama. Now that’s really lifted my spirits. Comes as no surprise as the population was imported by the Brits and don't worry about the home front, the EU will protect you. It's good to see 'Dave' supporting the right of self-determination to British citizens. I wonder when he will extend the courtesy to the people of England? Kirchner is not the exception but the rule when it comes to the type of person that we humans allow to govern us. It is only rarely do people rise to the top in politics that deserve to be there. We are incredibly gullible and perverse when choosing or following leaders. Yet in other walks of life extremely good people can and do fill positions of great responsibility and do their jobs well. In sum total though we come out as being incredibly stupid and something of an anachronism, we do not fit well in the living world. I am coming around to the belief that we humans are an accident of nature and not a natural extension of it. All living things have only two functions survival and procreation and you do not need the level of intelligence that humans possess for them to fulfil those functions adequately. In fact once the greens have had their way and we are forced back to being hunter gatherers the least intelligent of our species are the ones best equipped to survive. Intelligence is a positive disadvantage as instinct rather than deliberation is far better defence against hungry predators wanting to eat you, evasive actions are quicker. Only with the advent of agriculture and beyond did intelligence become an advantage but also a disadvantage as it made humans far to successful in fulfilling the two functions and thereby upsetting the balance of nature. To me nature made a very big genetic mistake in allowing humans to evolve the way they have. However seeing that it has we need to have another massive leap forward in our mental capacity if we are going to sort out past messes we have got ourselves into and to stop future ones occurring. Violence is the ultimate authority. I think the islands are the last thing Kirchner wants. She needs a distraction to take public attention off the disastrous economy.